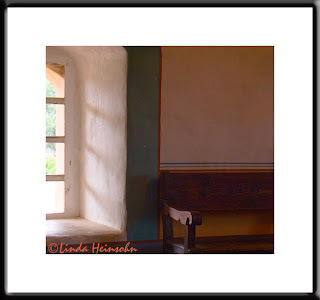 This photo is from a trip I made last year to La Purisima Mission with my friend Dawn. I felt drawn to the feeling of the light coming through the window by the wooden pew. The shot was completely 50/50 before editing. PSE4 was able to help me even out the contrast between the bright window light and the dark, church interior. Still, the shot needs something, I think. Perhaps an inflatable priest reading his bible.